Aww, they're so stinkin' cute! And they look very official in their backpacks! Are they working or just going on an adventure? How adorable are your pups? They look like serious backpackers! Love the pups! I wouldn't mind walking the dogs if they carried my things like water, phone, keys! My dogs just loved to backpack. This photo is actually our first hike of the year in Apr 2000 so packs are full of towels to add bulk. Dog have to accustomed to the extra width of the bags otherwise they scrape up against trees and each other. Then I would gradually add weight throughout the month until they could carry all the water needed for a 2-hour hike. When I would get the packs out the dogs could not wait to get strapped in. They loved it! Obviously I'm not "with it" because I didn't even know there WAS such a thing as a doggy-paack. Well when your dogs run away from home they really mean it don't they. The only thing my dog carries around with her is her smell. Love her though...Miss February on a 2010 calendar coming up. When we lived in Chicago I would strap up the dogs and take them to the farmer's market. It was so nice being able to load up their packs with vegetables and flowers. And of course they loved all the attention and pets. Loving your black dogs. Fabulous to see them doing work too. Yay you! Please may I come back and visit again? Absolutely adorable to see them hiking with their backpacks! 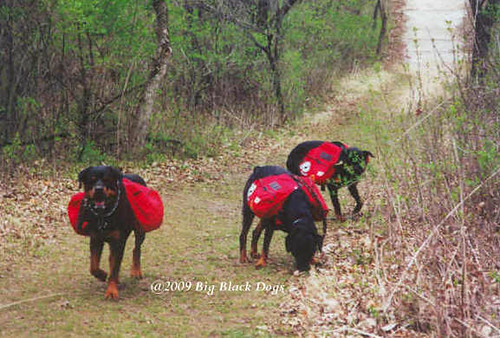 It's amazing how many people see a Rott (or any big dog) and will be afraid, but yet throw a backpack on them and all of a sudden they are okay (in ref to your comment about the hikers). hey i wear the same pack on me too. my humans fill it with weights so i get more energy out. only mine is a quarter the size of yours. your monkey bread post made me hungry! Hi, nice pics of the guys with their back packs. oh...thanks for that mac and cheese recipe, havnt tryed it yet but i will.